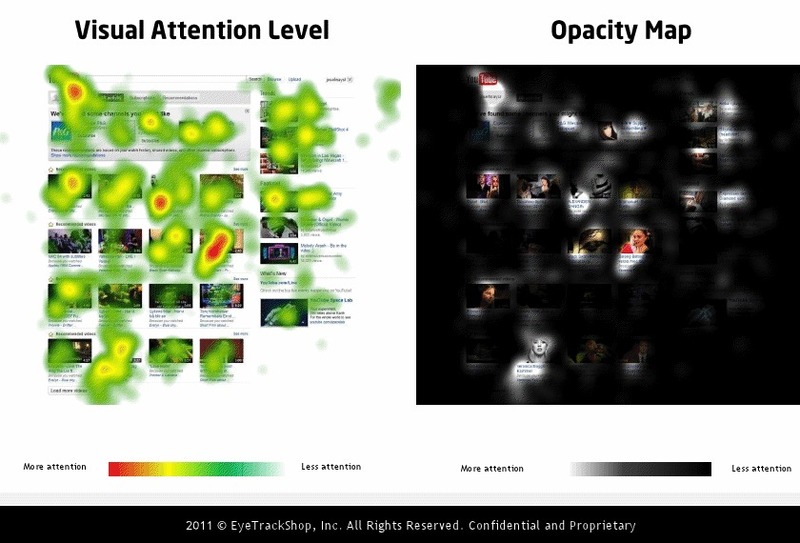 Mashable and EyeTrackShop did a study of several social media sites and buried in the data are two eye tracking studies on the YouTube homepage. All of the top thumbnails contained faces and humans. The most effective ones were close-ups. The 3 most effective thumbnails featured women. The most effective thumbnail, by far, featured a close up on a woman and what appears to be a bright red heart. Most of the top 6 thumbnails had a high-contrast background in either black or white. Two of the top 3 thumbnails were actually completely in high-contrast black-and-white. Black-and-white thumbnails aren’t widely used so this is a really interesting discovery. The least effective thumbnails appeared to be pulled from “bootlegged” footage from TV or a movie. Thumbnail effectiveness trumps upload order and probably even title in terms of fixation. It appears that after a user sees a thumbnail, they read the title of the video. Another interesting note — people are quite likely to fixate on their own profile icon and the adjacent functions there near the top of the page — comments and inbox. So, don’t count those out as effective ways to reach an audience. This entry was posted in Audience Development, Industry Commentary and tagged eye tracking, optimization, study, thumbnails, youtube on November 30, 2011 by lasr467.